Atul has rose from ashes and is in the league to become the best in town. Though he is leading his life like a king, he is falling in his personal life. Roshni and Atul had a love marriage but things are not that pretty as it seems. Even the happiest ones have some spots of uneasiness. What happen when one moves ahead in life very fast? When big names are associated what hindrances pops in front? Where the title had a larger appeal, the cover fails to impress me. The line of demolition showcase the shattering but nothing else the background shows to gave an insight about what the book contains. The characters were technocrats, politicians, family members, friends, policemen and what not. There were so many that the tale became gripping due to the efforts and actions which people had to bestow. The major characters were not much, just a man who had to say a lot about all that was happening around him. I loved Atul for what he was, what he became due to himself and others and how he made things around him. I loved his thought process and far-sightedness. From the minor characters I loved Aarti, Roshni, Ananya, Jyoti, Qazi, Shalikram and many more. Every person had a different state of mind and a different side to bring in front. Third person narration suited the tale well. The atmosphere of a big house or office, a country, state or situation, whatever came in front was done with utter preciseness. The narrator made every point, turn and situation crystal clear by maintaining a serene flow. “Destiny of Shattered Dreams” is the tale of a man who has seen various phases in his life and is still in the run to explore new dimensions. Atul is on the move from the very start and the tale is revolving around him and his ventures from the first page. His life is shown at large and thus the author have stuck to what he wanted to project in majority. The tale has moved from one phase to other with ease. The first section of the book has taken in notice the personal life and the people who are surrounding the main lead Atul. Excellence, intelligence and a want to achieve what he needs is shown on every page in the book. Corporate world is shown at large and thus the layers can enchant any reader. But at the same time the excess usage of terms of high order can disturb the essence of a fiction tale. When one moves to achieve heights then what comes in front of him/her is oblivious. The fact was always prominent in the tale and thus changes of same order came in front from time to time. The tale moves from one politician to other, one location to other and one setting to other. Also apart from the business sector, the novel has some extravagant love stories that took turns which were not very usual. I loved the way the author has tried to show the dark sides of different tales in a very normal way. The realizations which the characters experience makes the novel rise to a different level. The speeches which the characters used to support their point of view makes one wait and realize the depth with which the author has tried to connect with the readers. The end of the novel is my favourite part because it was nowhere near a normal ending chapter of any book. Unexpected ends, mind-blowing turns in the middle and a gripping tale of what one wants from life makes the book stand in a corner with pride. The ending speech by the lead seemed like a summation of the whole tale. 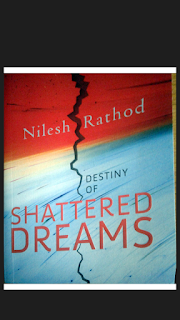 Summing up- Destiny of Shattered Dreams is a book with similar elements yet different mixtures. An amazing ride of complexities and tragedies with constant desire of more is what the book contains. A perfect showdown made the book reach tangents of different order. •Different places, characters, situations, atmosphere and stories, making the tale a perfect cobweb. •A well planned design to show the outcome in the upcoming chapters. •Smooth and easy going flow. •Perfect pauses and amazing pick-ups. •There were a lot of business related terms, ethics and explanations. One can happen to avoid such paragraphs without missing much of the story. The book can target any audience without hindering their choices. So, I can recommend it to any book lover who is looking for a simple yet gripping tale. Nilesh Rathod is a businessperson, writer and poet. Co-founder of Ensemble Infrastructure India Limited, Nilesh’s company currently employs over 2000 people. Destiny of shattered dreams is his debut novel. Nilesh is currently working on his second novel.